- Stephen Fearing, "The Life"
We started the fourth day of my 50th birthday trip in Sicamous, British Columbia. This was my actual birth day. 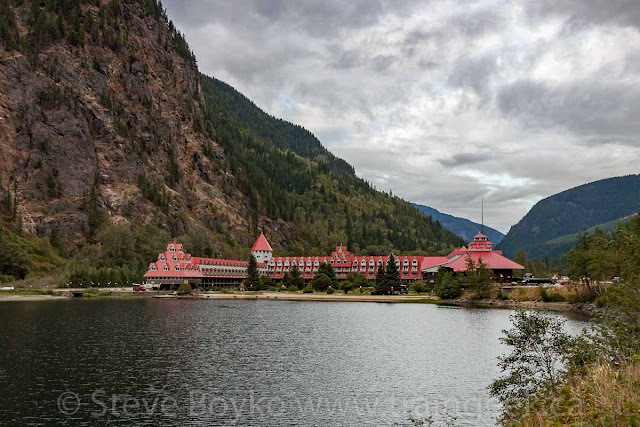 After a nice rest in the Best Western - and a nice free breakfast - we got back in our Chrysler 300 and headed out... a few hundred metres to the bridges over the Sicamous Narrows. 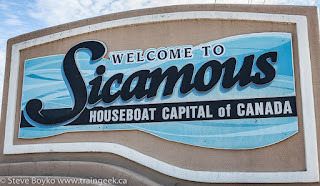 Sicamous - Houseboat Capital of Canada! 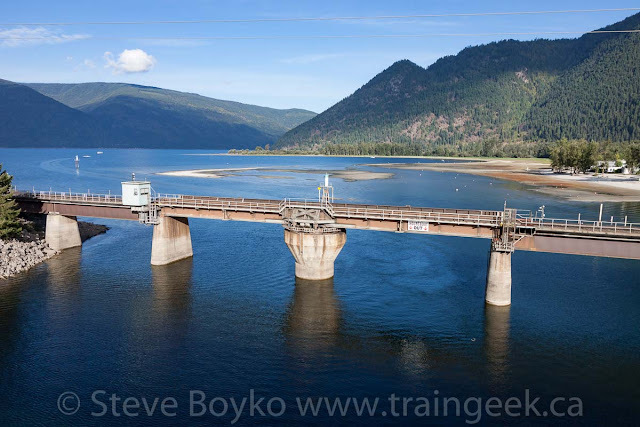 The Mara Lake empties into the much larger Shuswap Lake, and there are two bridges over the narrows - the highway bridge and a railway bridge, which is an operating swing bridge. 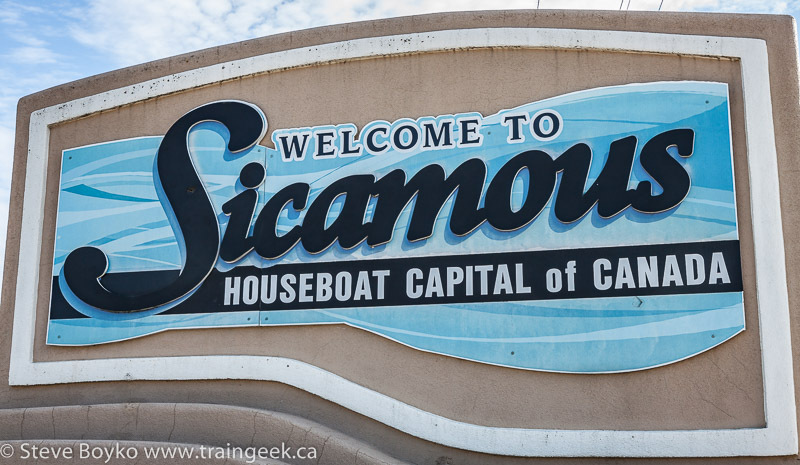 Sicamous bills itself as the "Houseboat Capital of Canada". We didn't go looking for houseboats, but I assume there were a lot of them! I was hoping for a train, so I spent some time walking around on the road bridge (the R.W. Bruhn Bridge, built in 1962, apparently being considered for a replacement), taking photos and wishing really hard for a train. I got the photos, but I didn't get a train. 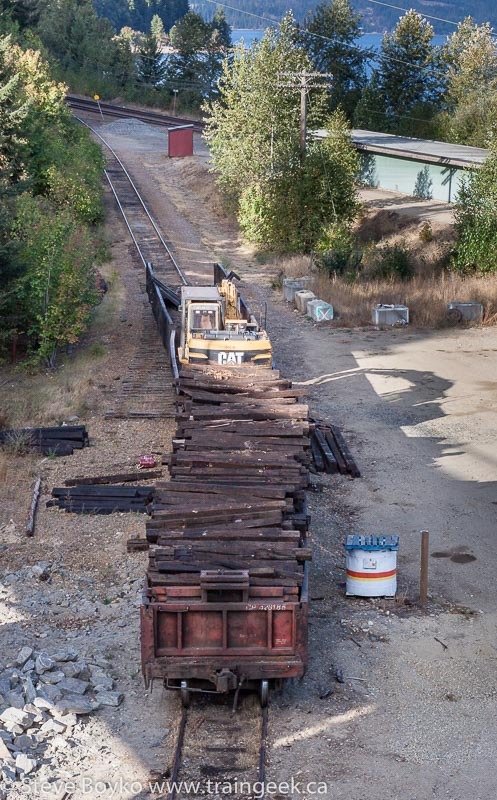 There is a bit of a stub track there, which contained a few gondolas overloaded with old railway ties and a backhoe. That bridge was as far west as we made it this trip. We headed east, en route to Three Valley Gap. On the way, we passed a few of British Columbia's many amazingly beautiful lakes, and I had to stop at one of them to take a few photos. BC is so beautiful. 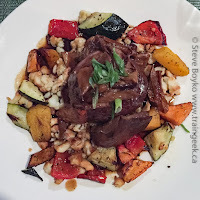 I mentioned that we had originally planned to stay at the Three Valley Gap hotel, but changed our minds before the trip. 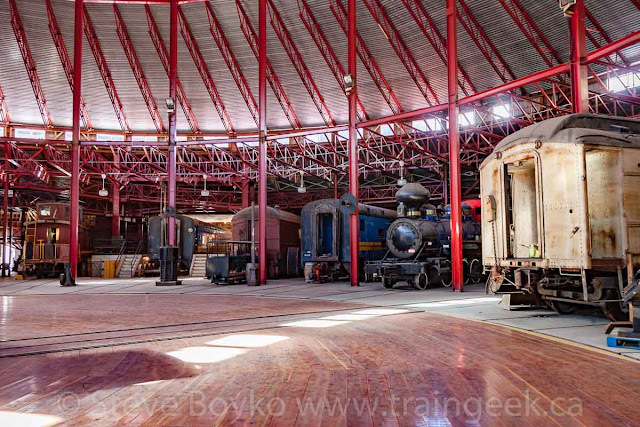 I still wanted to stop there, however, as they have a good collection of railway rolling stock there in a roundhouse. 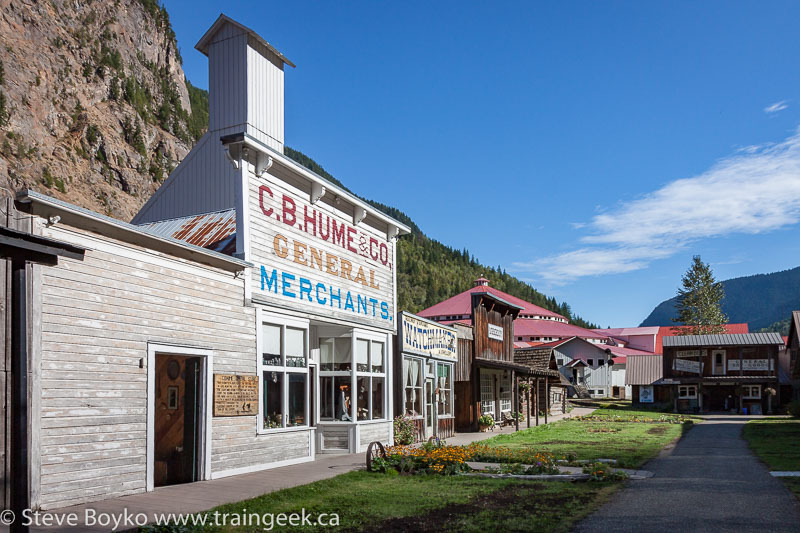 We paid the $12 entrance fee and wandered through the "ghost town". It's a collection of buildings from various locations gathered together to try to recreate a pioneer town. It was interesting - my wife liked the pharmacy - but I was intent on visiting the roundhouse and the cars there. I won't get into detail on the roundhouse - it probably merits its own post - but I'll make a few comments. The roundhouse is modern and looks it. It's quite large - 24 bays and about 300 feet in diameter. The roundhouse has the largest fully covered turntable in North America. About half of the stalls are occupied, with various pieces of rolling stock from various eras, mostly passenger cars. There are a few noteworthy cars - including ex VIA 1 (with a cardboard cutout of Pierre Trudeau) and ex BC Rail Caribou. Some are in the roundhouse and some are on display elsewhere on the property. I admit we rushed through the facility, spending just under an hour there. We probably could have spent another hour looking at the antique auto museum, studying their collection of fire trucks, and going into more of the buildings in the village. We headed east toward Revelstoke to visit the excellent railway museum there. 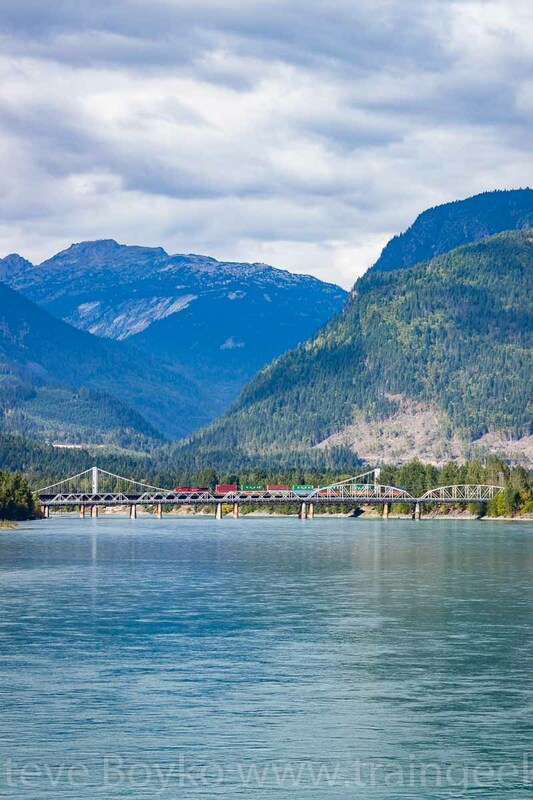 Like Cranbrook, I described the Revelstoke Railway Museum separately... but I'll say here that it was an excellent experience. It's a top notch museum well worth visiting. It's unabashedly CPR, as it should be, on CP's main line. I visited the gift shop and bought a few more BRMNA books to add to my collection. You may have seen these soft cover books - focusing on broad topics like Canadian Pacific in Manitoba, or very niche topics. They are out of print but pretty common in gift shops and at train shows, and relatively inexpensive. After we toured the museum, we bought sandwiches at a local supermarket and went to the Centennial Park along the Columbia River. It was a lovely place to have a little picnic lunch and take in the sights. 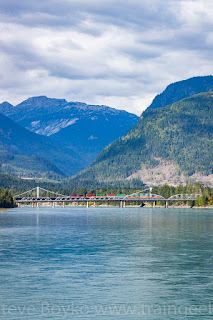 The weather was lovely, and CP even sent a train across the river during our lunch. 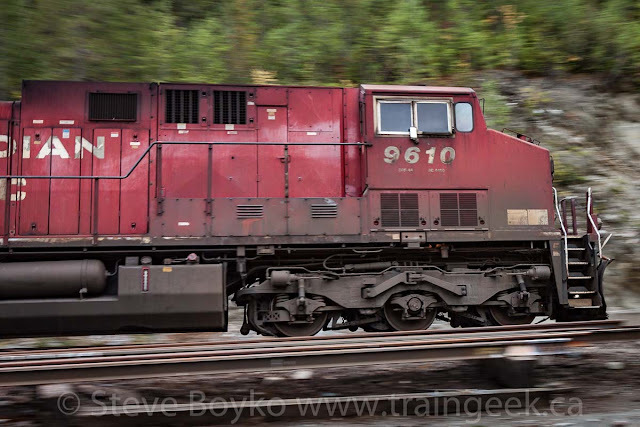 I didn't catch the lead engine numbers, but the trailing locomotive was CP 9677. It didn't matter... because I saw that train again later. 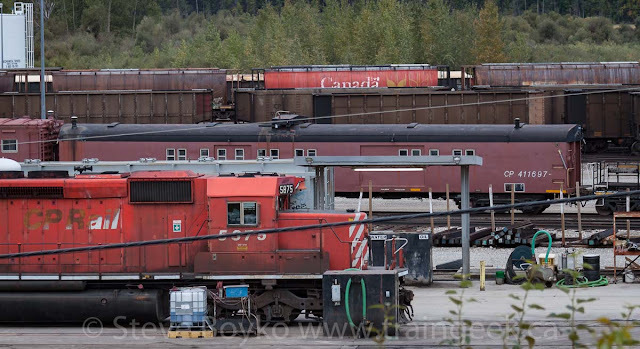 On our way out of town, I stopped at the CP yard in Revelstoke and snapped a few long distance photos of equipment parked there. There were a few snow plows, a yellow caboose with multimark, and this interesting spreader, CP 402862. East of Revelstoke, you enter part of the Selkirk mountain range. The views are pretty awesome and we had to stop a couple of times to take photos. After skirting Revelstoke National Park, we entered Glacier National Park. Just inside the park is this interesting structure on the CP Mountain subdivision at Flat Creek. I had spotted it before the trip when scouting locations, and I asked about it in the RailsBC group on Facebook. 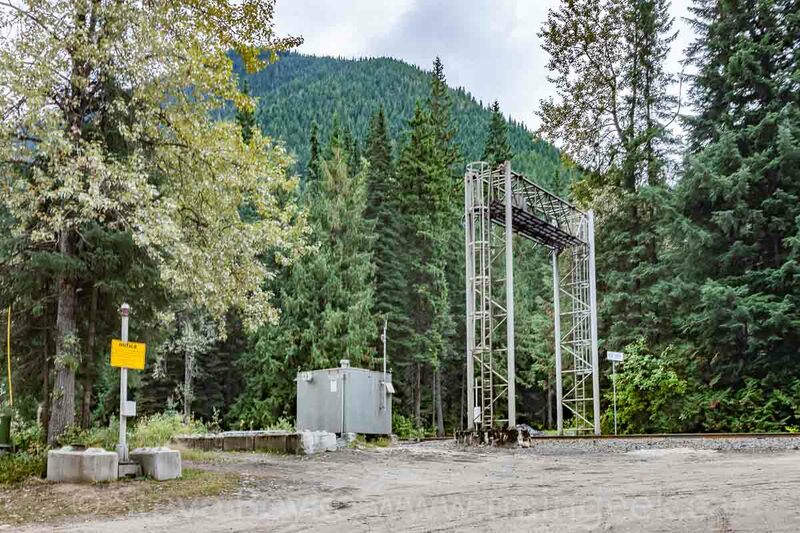 It's a dimension / shifted load scanner, used to alert train crews if their train won't fit in the Connaught or Mount Macdonald tunnels to the east. The yellow sign says "NOTICE: When red light is flashing, NO employee or others, either on foot or in motor vehicles are permitted to pass this point due to Avalanche Control." Not far after this, I found a spot with a little bridge and a snow shed that I thought would be nice to photograph trains at. I believe this was actually Flat Creek under the bridge, but I could be wrong. 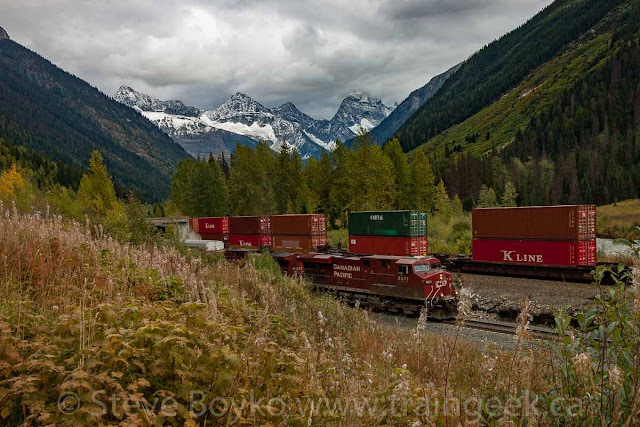 I was pretty sure we were ahead of the container train we saw in Revelstoke... but not too far ahead. 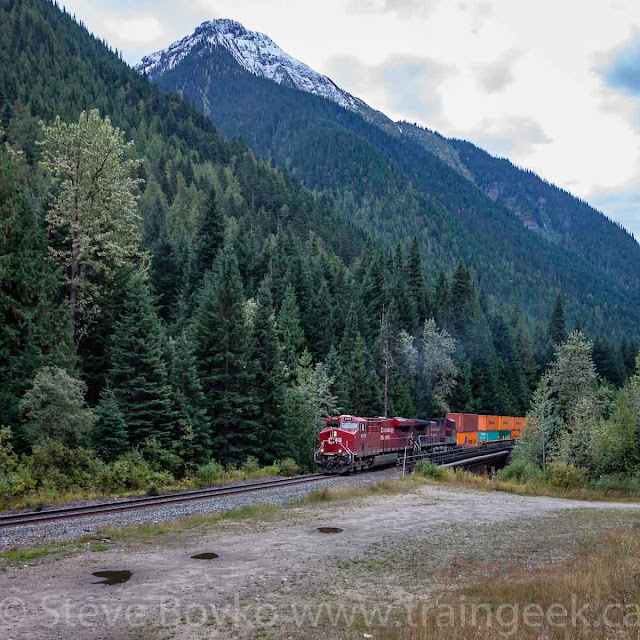 After a few minutes, I could hear a train labouring along through the mountains. I wandered around trying to find a decent location to capture both the "coming" shot on the bridge and the "going" shot through the snow shed. It helped that there was a little rise that I could stand on to get a little height while still staying well away from the tracks. Eventually CP 9376 East crossed the bridge and was imprinted onto my memory card. Unfortunately I blew the sky out a bit. The lighting was definitely challenging, as it was overcast and I didn't want to get the train in shadow. The "going away" shot was better. You can see the snow shed around the corner. No need for it yet, but soon! 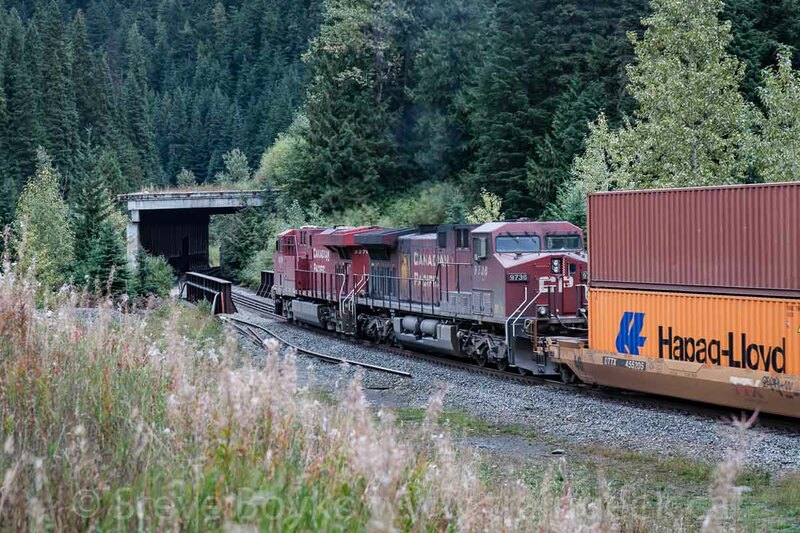 I photographed a few containers and then we hit the road... hoping for another shot. 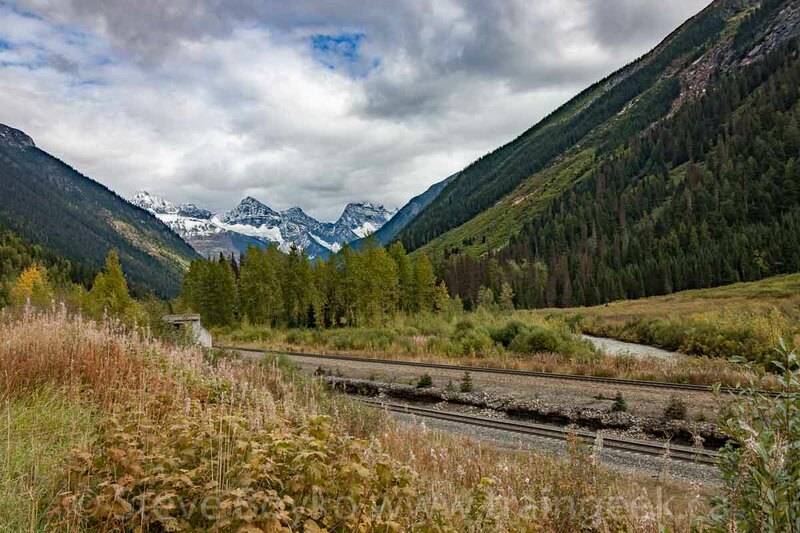 In my pre-trip scouting, I found the west portal of the Mount Macdonald Tunnel here - right by the highway. I was interested! 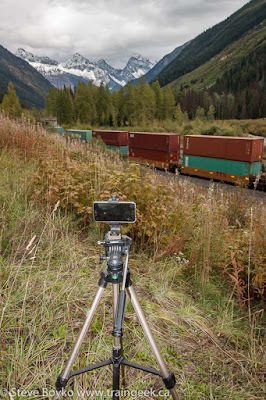 After shooting CP 9376 at Flat Creek, we were heading east when I spotted a good-looking spot to stop to shoot the train again. It turned out to be the portal! Total coincidence. You can see the tunnel portal to the left. 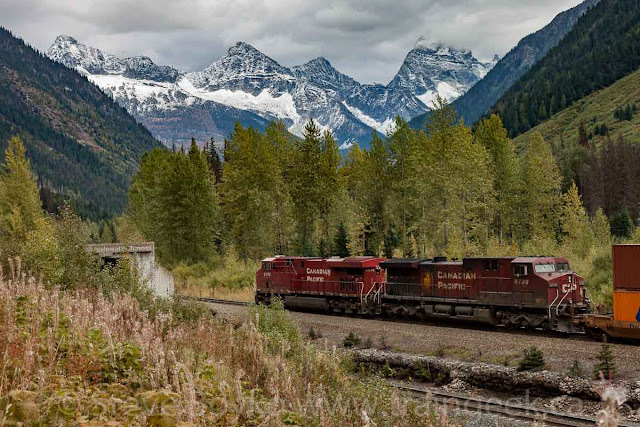 Generally westbound trains use the Macdonald Tunnel and eastbound trains use the Connaught Tunnel. I got there a good ten minutes before CP 9376 East arrived. I took a few photos to get the right exposure. I didn't want to get closer to the tracks because I wanted to stay in a safe spot, and I wanted the mountains in the background of the shot when the eastbound arrived. I couldn't help but notice a loud humming... coming from the tunnel. Could there be a westbound coming? After a few minutes, I had no doubt. Which train would arrive first? It was CP 9376 East that came first. I was happy with that because I could get an obscured photo of the train before the westbound came. It was not long before the westbound came - about 2 minutes. CP 8871 West! Wouldn't that have been sweet if the two trains had met in front of the portal? 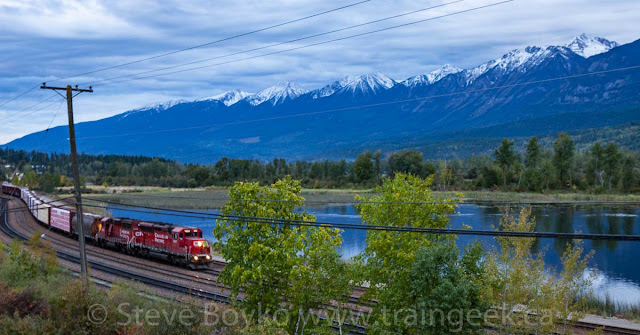 The mid-train DPU of the eastbound came along very shortly afterward. That Providence and Worcester autorack at bottom right is the second car after the second locomotive (CP 8506) of the westbound. Finally, CP 9677 came rolling by as the tail-end locomotive. That was the end of that eastbound train for me. A few minutes later, the westbound finished coming out of the tunnel, with no DPU anywhere in the train. 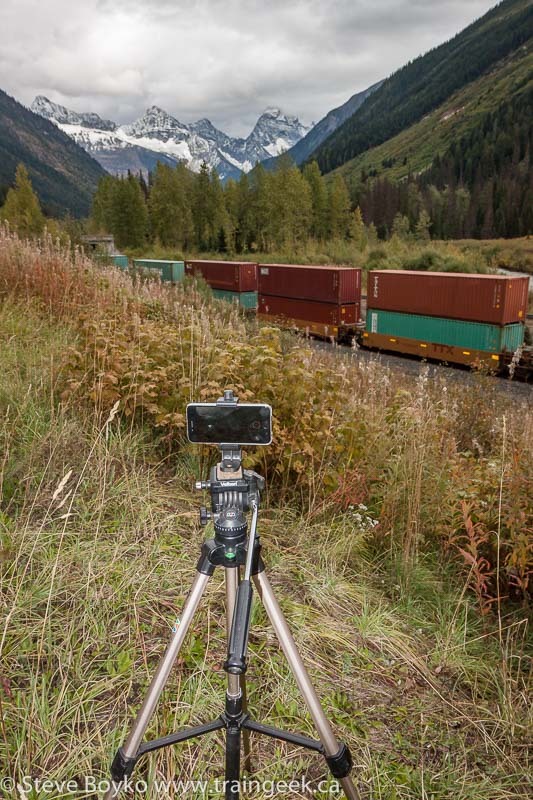 I was taking video with my phone on a tripod. Here's the video. Unfortunately my phone ran out of power before the end of the train passed, but it only missed a few empty platforms on the end. My wife will confirm that I was literally dancing for joy, having seen a meet at the tunnel portal. That was special - the meet, not the dancing. Pretty sure the dancing was awful. When I was planning this trip, I was asking around for photo locations and Kinbasket Lake was one suggestion. This is quite a long, skinny lake, created by the construction of the giant Mica Dam in the late 1960s and early 1970s. 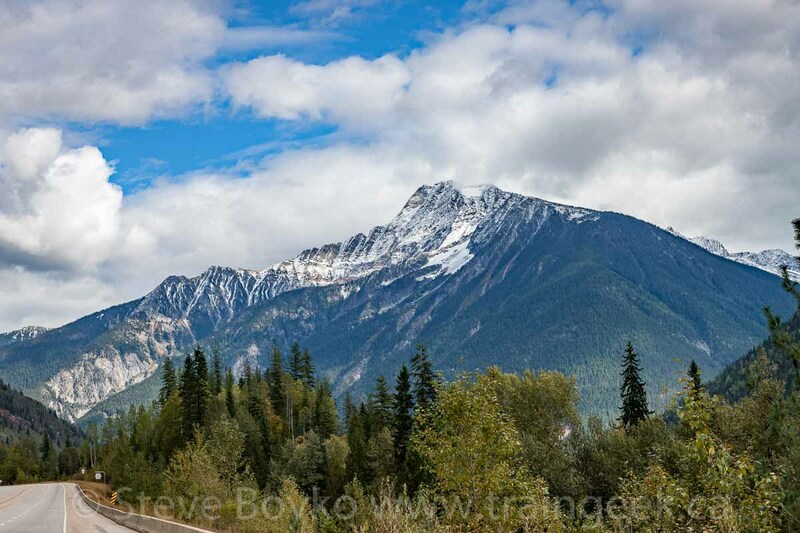 The Trans-Canada Highway passes near the very southeast tip of it. 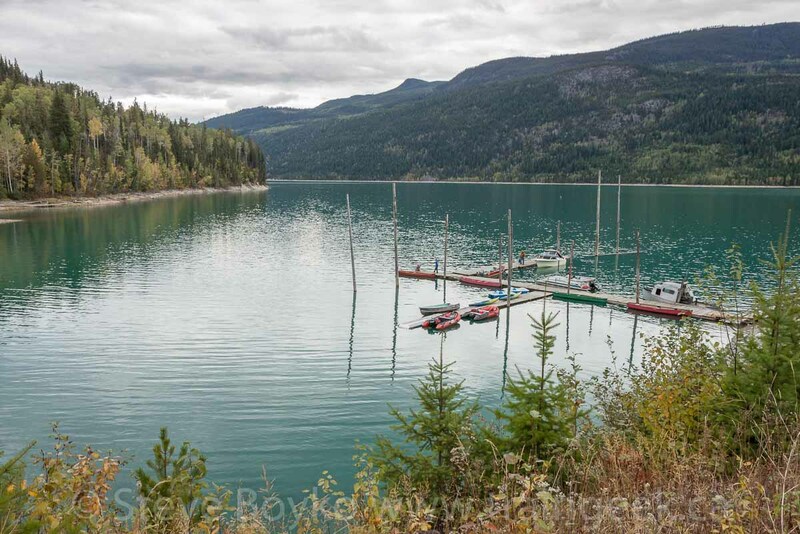 There is a campground there - the Kinbasket Lake Resort. The resort is accessible by a gravel road, and it's about a ten minute drive from the TCH through several switchbacks. I imagine it would be "fun" to take a trailer through there but obviously people do, as the campground had a lot of occupants when we arrived. We parked just outside the campground, after going through the railway crossing just above the campground. We were greeted by someone who in retrospect was probably the owner, five-time Stanley Cup winner Rick Chartraw. He was super friendly and graciously allowed us to wander around when we asked to take a few photos of the lake. Note the bridge in the photo below. It'll come up later. We spent a few minutes walking around and enjoying the peace and quiet. The smells of cooking drifted from the campground and my stomach rumbled a bit - it was 5:30 PM or so - so we took our photos and started back. Just then, I heard the crossing bells start. "RUN!" my wife said, and so I did, running up the hill to the crossing to try to catch the train there. There was CP 9819 East, rolling through the crossing at mile 54.59 of the CP Mountain subdivision. It was a potash train. 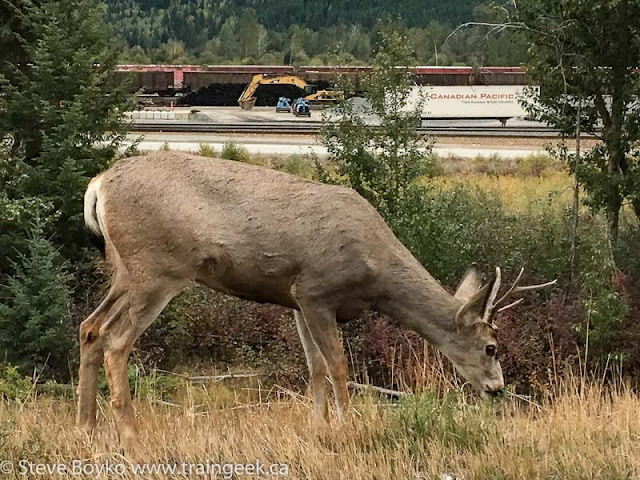 That train was really moving! Dozens and dozens of potash cars flashed by, and I couldn't help thinking that it was good that this crossing had lights and a bell, because it would be very dangerous to have simple crossbucks at that location with no sight lines for drivers to see any approaching trains. 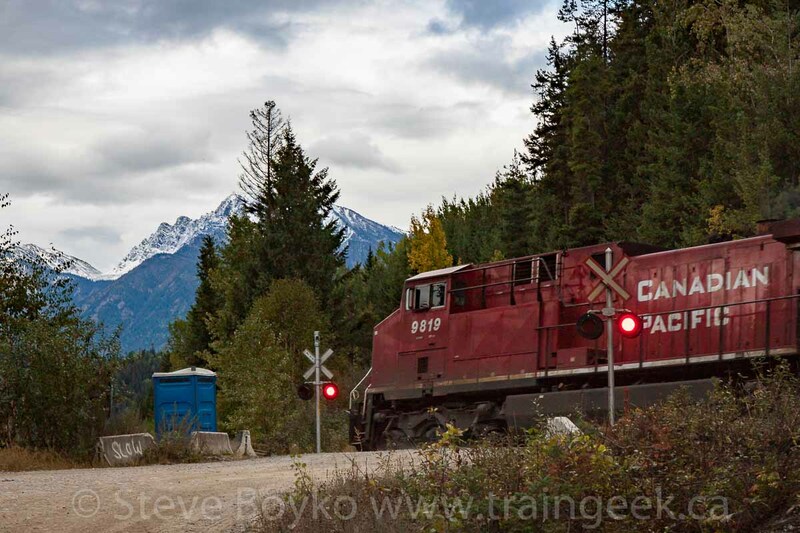 CP 9610 was on the tail end. This trip was definitely helping me practice my panning skills! I returned from the crossing and she beckoned me onto the bridge to see what I missed. We agreed that she definitely had the better spot. We returned to Golden, this time to stay for the night. I had booked a room at the Holiday Inn Express - again, with points. It was a nice place to stay, as this chain usually is. I wanted to peek in the Golden yard before supper. I spotted a few interesting cars in the yard, including several cabeese, sleeper units on flatcars, and ex baggage (?) car CP 411697. My wife spotted a deer having a snack by the road and captured this great photo of it. I'm beginning to think I should stick to writing words and leave the photography to my wife! I went down to the south end of the yard and spotted CP 2295 and CP 2291 doing some shunting. It was getting a little dark by then (7:15 PM) but I did what I could. It helped that they weren't moving! 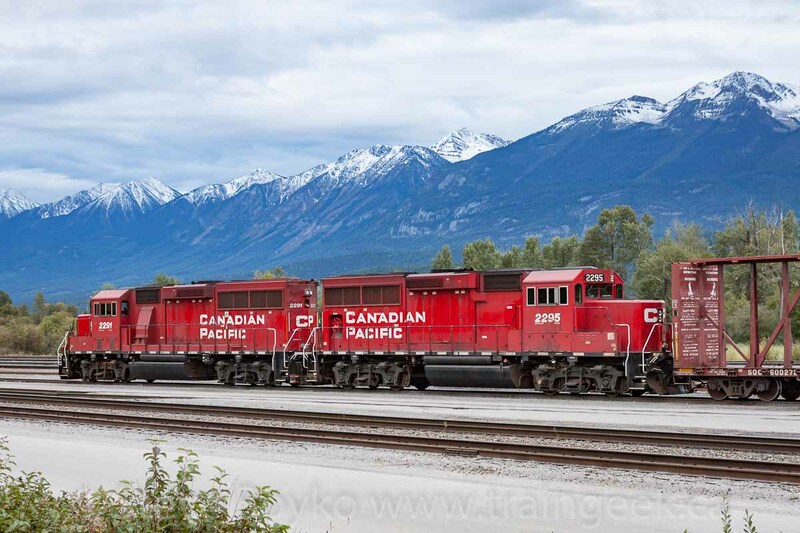 We were just about to leave when I heard a train coming in off the CP Windermere subdivision, led by another pair of ECO units - CP 5007 and CP 2243. These were harder to photograph because they were moving. I elected to keep the background in focus and let the train blur, rather than pan and lose the background. That was finally the end of the train watching for the day. 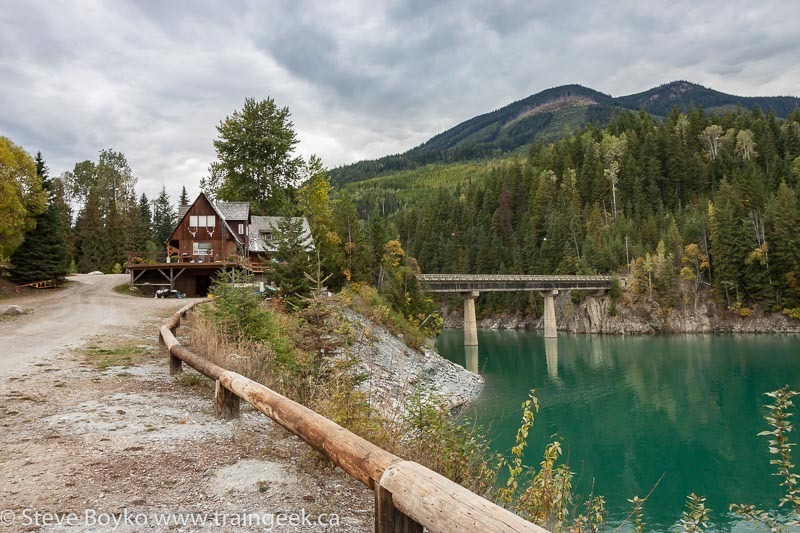 We spotted a nice restaurant on the island in the middle of the Kicking Horse River, appropriately named the Island Restaurant. HIGHLY recommended. The service was great, the food was fantastic, and they even brought out a free brownie for dessert when they found out it was my birthday. 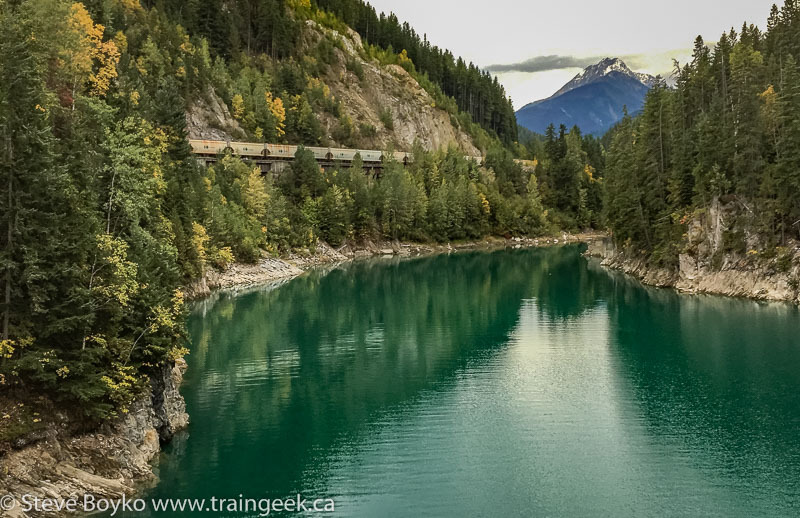 The plan for day 5 was to travel from Golden to Banff through Field and Lake Louise, railfanning along the way. That's basically what we did, with a bit of detouring... READ ON! Part 4 - To Craigellachie and Beyond! Excellent photos by you and your wife! BC is beautiful for sure. I like the east and west bound trains by the tunnel. Looks like it was an awesome birthday day and trip!! 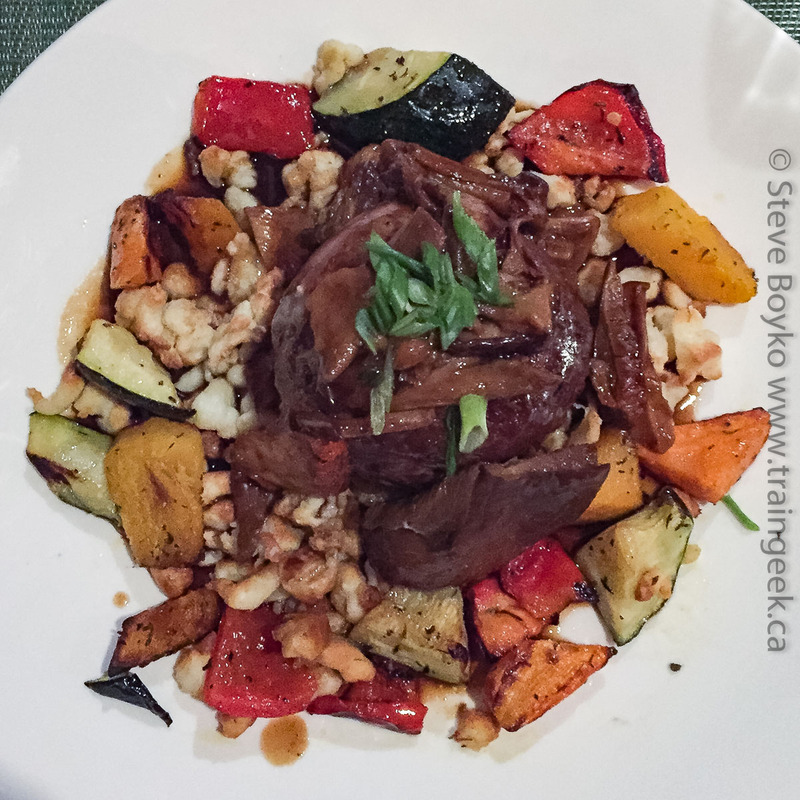 Great travels and great photography in this series, Steve! 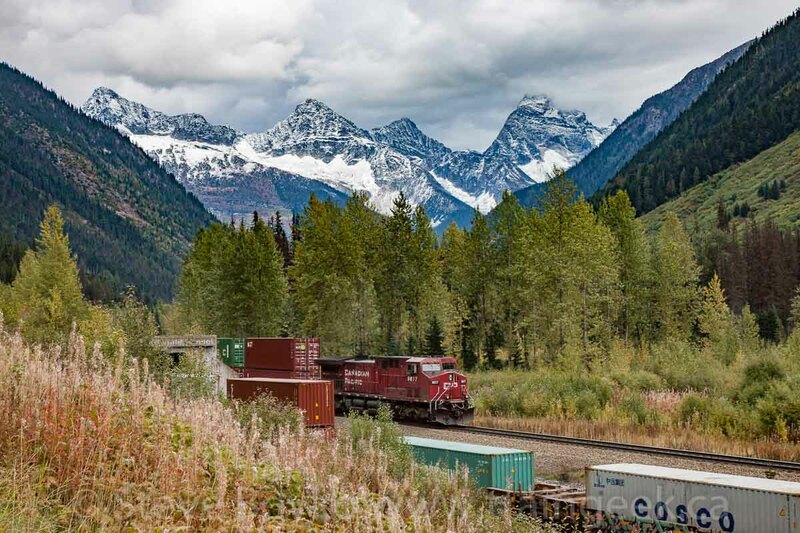 I like the pans, the scenery and of course the SMW covered hopper! Sounds like a neat trip for sure! Thanks, Jenn! It was awesome indeed.